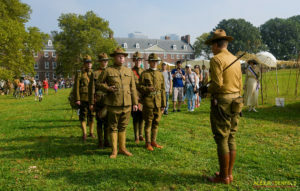 The World War One weekend at Governors Island National Monument was a smash success on September 16-17. The highlight was the rededication ceremony of three lost and damaged WWI memorials on city property, for the Governors Island Memorial Project. With this being the centennial of American entry into the Great War, and Governors Island playing a big part, the large “Camp Doughboy” at the National Monument was perfectly timed. We had a 1917 tank, and General Pershing, portrayed by David Shuey of Virgina, brought a horse back to the island. Organizations that supported the event were the WWI Centennial Committee for New York City, Long Island Living History Association, and the East Coast Doughboys. This event drew 6,500 on Saturday and 7,500 on Sunday. It was by far the largest WWI exhibition in the U.S. this year. The 1st Battalion, 16th Infantry, 1st Division, came from Fort Riley and led the Centennial ceremonies the reenactors held at Fort Jay. These were the same Soldiers—the very same color guard—who were in Paris in July on Bastille Day to represent the U.S. Army. The active duty Big Red One marched at the front of the parades, and the Doughboy reenactors represented the Great War. We rededicated three WWI memorials, welcomed 65 reenactors, saw 25 living history civilians, and displayed five vintage vehicles. The event was also accident-free. We could not have had such a successful event on this scale without the National Park Service. We received excellent support from rangers Renee Runyon and Joe Korber. They were on top of everything all weekend and gave us incredible assistance for all of our needs, from water to electricity, to firewood and trash bags. Joe even performed the National Anthem for the welcome ceremony on his fife. The other rangers and park volunteers were also a constant presence to help us with the big crowds we drew both days. Special thanks to Ranger Barbara Applebaum for her enthusiasm on the first day and offering her remarks on behalf of the Manhattan Sites to the attendees and participants, and to Ranger Michael Frazier for meeting with the living historians. Plans are already being made for September 2018 and the return of Camp Doughboy.